Today's pattern is the Proxy pattern, another simple but effective pattern that helps with controlling use and access of resources. A Proxy can also be defined as a surrogate. In the real work a cheque or credit card is a proxy for what is in our bank account. It can be used in place of cash, which is what is needed, and provides a means of accessing that cash when required. And that's exactly what the Proxy pattern does - controls and manage access to the object they are "protecting". So it's quite a simple concept - to save on the amount of memory used, you might use a Proxy. Similarly, if you want to control access to an object, the pattern becomes useful. As usual, when dealing with design patterns we code to interfaces. In this case, the interface that the client knows about is the Subject. 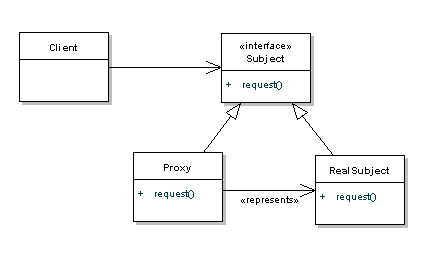 Both the Proxy and RealSubject objects implement the Subject interface, but the client may not be able to access the RealSubject without going through the Proxy. It's quite common that the Proxy would handle the creation of the RealSubject object, but it will at least have a reference to it so that it can pass messages along. Let's take a look at this in action with a sequence diagram. As you can see it's quite simple - the Proxy is providing a barrier between the client and the real implementation. There are many different flavours of Proxy, depending on it's purpose. You may have a protection proxy, to control access rights to an object. A virtual proxy handles the case where an object might be expensive to create, and a remote proxy controls access to a remote object. You'll have noticed that this is very similar to the pattern. However, the main difference between bot is that the adapter will expose a different interface to allow interoperability. The Proxy exposes the same interface, but gets in the way to save processing time or memory. Typically, you'll want to use a proxy when communication with a third party is an expensive operation, perhaps over a network. The proxy would allow you to hold your data until you are ready to commit, and can limit the amount of times that the communication is called. Now the Proxy implementation can be written, which provides access to the RealImage class. Note that it's only when we call the displayImage() method that it actually uses the RealImage. Until then, we don't need the data. And it's really as simple as that. As far as the client is concerned, they will just deal with the interface. Usually this is the stage that I point out the disadvantages to the pattern. Proxy is quite simple, and pragmatic, and it's one pattern that I can't think of any downsides for. Perhaps you know of some? If so, please share them in the comments section. The Decorator pattern is a close relation to the Proxy pattern, so we'll take a look at that next week.